First positive signs as Namibia’s former colonial master Germany apologizes for genocide that killed 65,000 from Herero tribe about 100 years ago. Germany has offered its first formal apology for the colonial-era massacre of some 65,000 members of the Herero tribe by German troops in Namibia. German minister Heidemarie Wieczorek-Zeul told a commemorative ceremony that the brutal crushing of the Herero uprising 100 years ago was genocide. 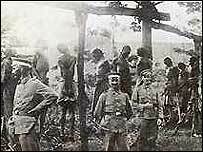 But the German government has ruled out compensation for victims’ descendants. A group of Herero has filed a case against Germany in the United States demanding $4bn in compensation. “We Germans accept our historic and moral responsibility,” Ms Wieczorek-Zeul, Germany’s Development Aid Minister, told a crowd of some 1,000 at the ceremony in Okokarara. Herero chained during the 1904 rebellion. But after the minister’s speech, the crowd repeated calls for an apology. “Everything I said in my speech was an apology for crimes committed under German colonial rule,” she replied. The Herero rebelled in 1904 against German soldiers and settlers who were colonizing south-west Africa. English: Surviving Herero after the escape through the arid desert of Omaheke in German South-West Africa (modern day Namibia). In response, the German military commander, General Lothar von Trotha, ordered the Herero people to leave Namibia or be killed. Herero were massacred with machine guns, their wells poisoned and then driven into the desert to die. Ms Wieczorek-Zeul repeated that there would be no compensation, but she promised continued economic aid for Namibia which currently amounts to $14m a year. German troops fight the Herero, circa 1904. Painting by Richard Knötel (1857-1914), published in a 1936 book. Germany argues that international laws to protect civilians were not in force at the time of the conflict. However, correspondents say the lawsuit filed in the US three years ago against the German government and two German companies is seen as having a limited chance of success. Posted on 28th April 2014 by newsafrica. This entry was posted in Africa, Germany, Headlines, Herero Genocide-Namibia, Human Equality, Human Rights Violations, Namibia. Bookmark the permalink.